Home / Partners / Charles S. Corprew, III, Ph.D.
Dr. Charles S. Corprew, III is a transformational consultant, speaker, and leader. He dares to ask individuals and organizations, “What’s Your Revolution?” With his engaging speech and dynamic method of building relationships with stakeholders coupled with experiences as a scholar/activist, Charles has become sought after for his ability to provide innovative solutions that aid individuals and organizations to reform the world. Charles is the founder and president of WYRevolution Consulting, a firm dedicated to help organizations solve complex issues using a system thinking framework with an equity lens. Prior to starting his consultancy, Dr. Corprew was a fervent educator, spending 18 years teaching at the secondary and post-secondary levels. As a professor at Loyola University New Orleans, he devoted his time teaching and researching the development of adolescents and emerging adults in diverse contexts, in particular, African American males. His publications can be found in Urban Education, The Journal of College Student Development, and The Journal of Men’s Studies to name a few. Charles is also widely cited in local and national media, including the New Orleans Times-Picayune, The Baltimore Sun, The Jackson-Free Press, Inside Higher Education, The Good Men Project, and The Huffington Post. 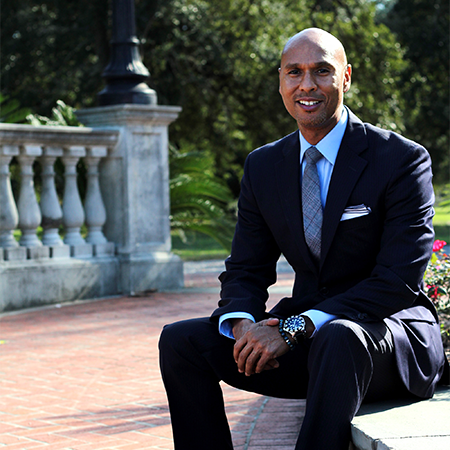 Dr. Corprew received his doctoral degree in Psychological Science from Tulane University. He also holds a Master of Arts in Teaching from Norfolk State University and Bachelor of Arts in History from James Madison University. Dr. Corprew was instrumental in constructing the mentoring component of New Orleans Mayor Mitch Landrieu’s NOLA for Life program. In 2014, Dr. Corprew received a W. K. Kellogg Foundation Community Leadership Fellowship. This is a prestigious three-year fellowship provided to 120 community activists from diverse backgrounds across the country. The fellowship has allowed Charles to receive trainings in the power of story telling, systems thinking, adaptive leadership, facilitative leadership, and project management. The knowledge gleaned from these experiences shapes how he helps individuals and organizations change the world.